You are here: Home / OAN Members / McPheeters Turf Inc. This second-generation, family-owned-and-operated farm specializes in turf grass and plants that thrive in Central Oregon’s high desert climate. Butch and Sharon McPheeters were sweethearts at Redmond High School in Redmond, Oregon. They married in 1967 while Butch was serving in the United States Air Force. 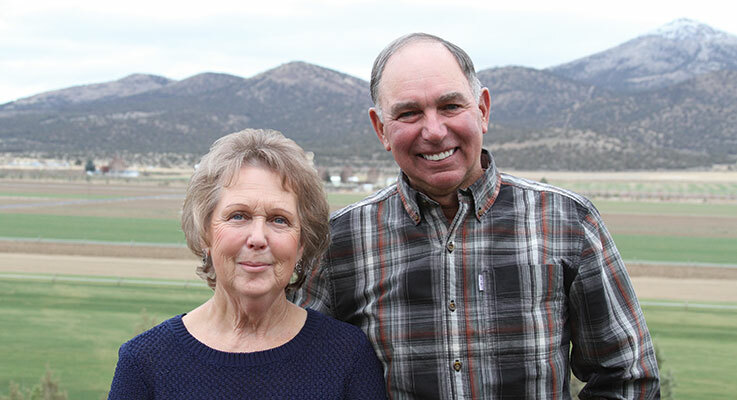 They purchased their farm in 1974, adding sod production in 1979 and nursery material in 1988. How many nursery businesses can say they began as a Future Farmers of America project? Actually, more than you may think. It just takes an interested student, a mentor to assist, available land and a lot of hard work. All four of those ingredients were in place when Tonya (McPheeters) Decker — the eldest daughter of sod and crop farmers Butch and Sharon McPheeters — potted up some four-inch plugs from Monrovia over spring break 1988. With help from retailer/landscaper Gary English, owner of Landsystems Nursery, the high school sophomore grew the plugs into 1-gallon material, some of which English then purchased. Soon, Tonya’s younger sister, Brenda (McPheeters) Potampa, joined in the business. The venture ended up funding both of their college educations at Washington State University. Today, Tonya works in crop insurance, but her former FFA project is still around. McPheeters Turf sells nursery products, as well as the turf grass her parents had started growing about nine years earlier. They also grow agricultural field crops, such as wheat, peppermint, grass seed and potatoes. And it remains very much a family-run company. Butch and Sharon are still involved, as are younger daughter Brenda and her husband, Jason Potampa. “We feel very proud that they’re a part of it,” Butch said. “We’re thankful we’ve got a family that wants to farm, and farms together,” Sharon said. From their new home, Butch and Sharon have a commanding view of the fields where their turf, nursery products and field crops are grown. They can also see another small farm nearby, where Butch grew up. Both farms are located on a high desert plateau near the small community of Culver. Nearby is the dramatic and winding Crooked River Gorge. Not far away is the climbers’ paradise of Smith Rock. These are familiar sights for the people visiting Central Oregon, as well as the increasing numbers who have moved there permanently. “(Today), a lot of people have second homes here,” Butch said. But when Butch grew up, the area was more dedicated to farming and ranching. The resort communities and their associated population boom had not yet arrived. Butch and Sharon attended Redmond High School together. Butch graduated in 1965 and enlisted in the United States Air Force. He served four years, including 18 months stationed in Panama. Midway through this enlistment, Butch and Sharon married in 1967. Butch and Sharon purchased their own farm in 1974. Initially, they farmed carrot seed, potatoes and grass seed. In 1979, they started their sod business. It was a prescient move, considering the population surge that was to come in Central Oregon. As mentioned before, the nursery part of the business started in 1988 with Tonya and later Brenda. After both daughters went away to college, Butch and Sharon were left in charge of the remaining nursery stock, which was considerable. It’s been running smoothly since. Both the nursery and sod businesses sell to retail as well as wholesale customers. “When you live in a smaller area like this, it’s hard to just be wholesale,” Butch said. The turf business specializes in a bluegrass blend grown specifically for the more arid climate of Central Oregon. Customers are mainly landscapers and builders working on projects including residential lawns, golf courses, greens, fairgrounds, athletic fields and schools. Turf sales took a hit from the Great Recession but have rebounded lately. Customers are located primarily up and down U.S. Highway 97, from Goldendale, Washington, to Klamath Falls, Oregon. The nursery business, meanwhile, has a wider geographical range, with products shipping to Central and Eastern Oregon. Although most Oregon nursery growers are located west of the Cascades, the McPheeters have found it advantageous to be located on the east side. They can grow plants, trees and shrubs that are already adapted to dry climates. “Our goal is to grow products that will survive here with our changing climate,” Sharon said. The nursery generally avoids growing the lush, flowering plants favored in the Willamette Valley. In Central Oregon, those plants tend not to survive winter snows or summer heat — and if they do, there are the appetites of deer to consider. “People just want something the deer aren’t going to destroy,” Butch said. The company’s field-grown trees include aspen, ponderosa pine, Colorado spruce, crabapples, Norway spruce and Frasier fir. In containers, the company grows barberries, spirea, ornamental grasses, rhododendrons, coralberry, serviceberry and willows, among others. The retail nursery is strictly about plants — no furniture, no fertilizer and no pottery. It’s open from Monday through Saturday in the springtime. Sunday is still reserved for church and family time. Butch works primarily with the turf side of the business. Sharon works in the office and interacts with customers. “They’re all people who love doing what they’re doing,” Butch said. Brenda is in charge of container production and nursery sales. Jason is in charge of field-grown trees and crops. “He always says he’s not done playing in the dirt yet,” Sharon said.